Peri-implantitis is an inflammation of the mucosa (gums) around the implant with loss of supporting bone. These infected implants can be lost if the proper treatment is not provided. Drs. Florence, Lincks and Demetter have successfully treated numerous ailing and failing implants using the most up-to-date treatment modalities currently available. If your dental implant is showing signs of failure, call our office for an evaluation and treatment. 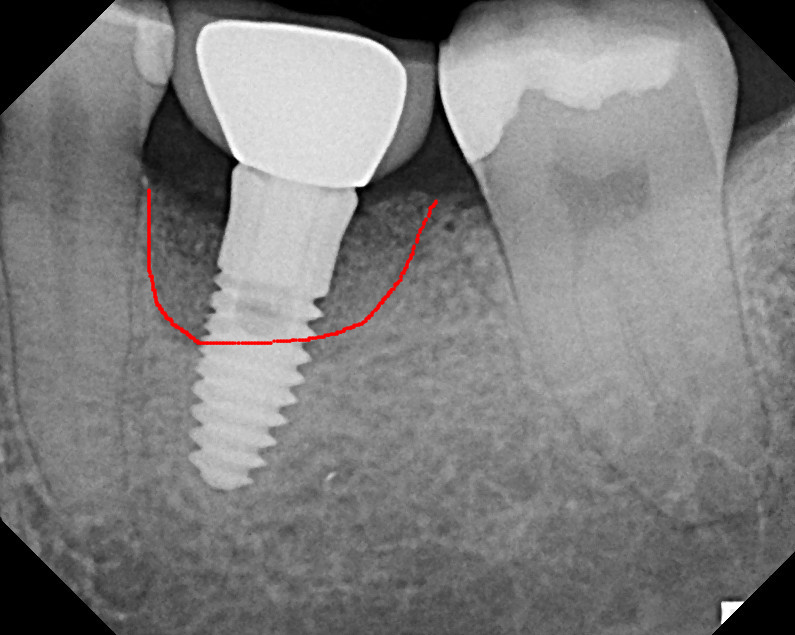 Below is an example of an implant successfully treated for peri-implantitis by Drs. Florence, Lincks and Demetter. Pre-operative radiograph showing bone loss (outlined in red) around failing implant. Post-operative radiograph showing successful treatment with new bone around implant.